What do Grace Jones, Tom Tom Club, Talking Heads and Sly Dunbar all have in common? 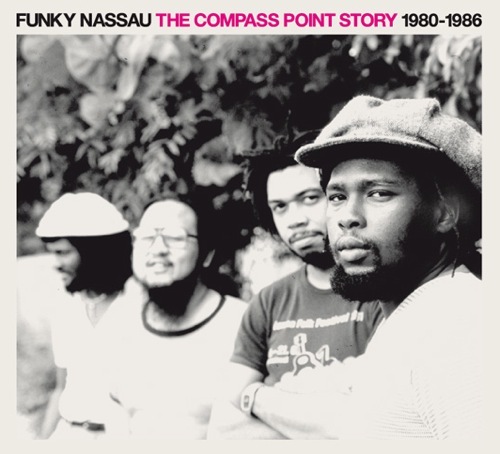 Besides all being progenitors in their respective, then, nascent genres, they all recorded at Chris Blackwell’s Bahamanian Compass Point Studio and are part of the Funky Nassau: Compass Point Story compilation. I name checked New York Noise at the tail end of the Dinosaur post Tuesday, and in a parallel universe this comp is easily a close cousin. They share more than a few common bonds. Reissued in 2008, I’m bringing this set up for a couple of reasons: 1) I saw, and was blown away, by Grace Jones last week at the Hollywwood Bowl (her first tour in nearly two decades, and 2) Funky Nassau can now, at the tail end of the ’00s, be viewed as a blueprint for what at times feels like half the the sounds gracing indie-leaning music blogs over the past 12 months (most recently exemplified by pitchfork’s new “summer music” feature). Proto-this, proto-that. Within the compilations 13 tracks you’ll find a scattershot sampling of dub, African poly-rhythms, deep rolling basslines, electro-funk, scratch rhythm guitar, Jamaican funk, and synths all under a decidedly ‘world’ music umbrella without the typically associated tired label trappings. Not unlike their neighbors Studio One, Compass Point had its own sound; a more subtle sound but one that artists wanted to capture nonetheless. Whereas Tom Tom Club’s “Genious of Love” and Talking Heads “Born Under Punches,” the first track off their opus Remain In Light, are most likely known to anyone interested in such a compilation to begin with, The Compass Point Story digs deep. Along with the higher profile Western ‘stars’ contributions, listeners are also treated to less celebrated, but equally interesting/engaging artists. Below is one such tune– Guy Cuevas’ “Obsession.” Dig. this ones up their with the numero’s cult cargo: grand bahama goombay and belize city boilup. a choice island soak, for sure. Also where Stockholm Syndrome and Widespread Panic have been recording the past few years. when widespread was recording there, someone found the Compass Point main man Terry Manning’s blog on a recording/tech site. i started emailing him back & forth. nicest guy you’ll ever meet. the man cut his teeth @ Stax…ran the board for Big Star and Al Green and more. He has some great Compass Point stories. they have a collection of old instruments, including a Dobro-ish guitar that belonged to Robert Johnson. Even let JB use it for one of the Panic tracks. great post. question: if you are a band with someone else’s money budgeted for recording, why WOULDN’T you go somewhere tropical?